You can change the domain used for your HubSpot content by adding it to your domain manager, then setting it as the new primary domain for your content. Additionally, Marketing Hub Enterprise accounts can use different domains for individual blogs, landing pages, and website changes. In the left sidebar menu, navigate to Domains & URLs. If the domain you want to use as the new primary domain is not yet connected, connect the domain. In the Primary domains section, click the Edit dropdown menu for the content type whose primary domain you are replacing. Then select Replace primary domain. In the dialog box, click the Select a new primary domain dropdown menu and select the domain, then click Replace primary domain. Please note: HubSpot will not create URL redirects when you make changes to your domains. However, if a domain becomes a redirect domain, then any traffic to that domain will be 301 redirected to the primary domain for the selected content type. If www.domain.com isn't used as a primary domain or secondary domain for any other content types, the domain manager will keep www.domain.com connected as a redirect domain. This will create 301 redirects from www.domain.com to blog.domain.com from the domain manager. If you're hosting your blog and any other content types (i.e., landing pages) on www.domain.com, this domain won't be available to connect as a redirect domain. In this case you'll need to set up URL redirects for any existing blog content. You may need to update the target domain for your account. Previous website visits to the old domain will still appear in your analytics in HubSpot, and you'll be able to view the old URLs in your page performance data. The visit data will remain in your sources report. However, you'll no longer be able to sort your visits by your old domain if it is no longer a primary domain in your domain manager. If you have Marketing Hub Enterprise account, you can select different primary domains for your individual blogs, landing pages, and website pages. 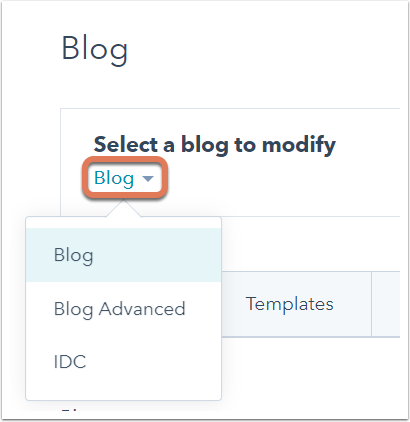 In the upper left, click the Select a blog to modify dropdown menu and select a blog. Click the Blog root URL dropdown menu and select a domain. In the bottom left, click Save. In your HubSpot account, navigate to website pages or landing pages. In the Page URL field, click the pencil icon edit. In the dialog box, click Update. In the Page URL field, click the domain dropdown menu and select a new domain. In the upper right, click Update to take the URL change live.